This is one of those simple "no brainer" dishes but I have come to the realization that these days using my brain has become more difficult. This week in addition to my normal basket of fruits and veggies from Bountiful Baskets, I also got an Asian pack. For a few extra Washingtons, I got fresh water chestnuts, bok choy, napa cabbage, eggplant, onion, garlic, green onion, ginger root, and more stuff that I can't recall right off the top of my head. (Don't know what I am talking about? Check it: Here. I label all dishes that I create using fruits or veggies from my basket. So, keep your peepers peeled.) Try this dish! You won't regret it. If you do, well then I'm sorry. Cook bok choy for about 3 minutes and add water. Cook for about 10 minutes to cook water out. 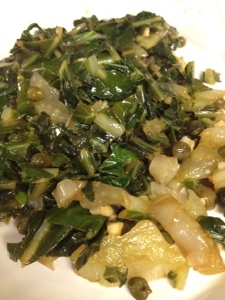 Stir in the capers, garlic and ginger. Cook for about a minute more. Sprinkle with balsamic vinegar and lemon juice. Remove from heat; serve immediately.